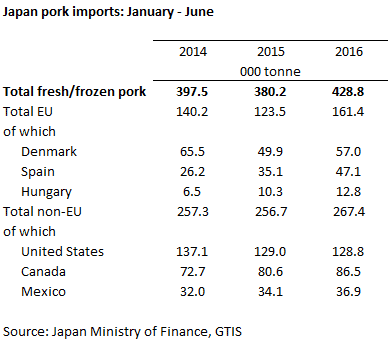 JAPAN - Japanese imports of fresh/frozen pork increased by just under 13 per cent, to 429,000 tonnes, in the first six months of the year. This was driven by an increase in shipments from both EU and non-EU countries. The value of these imports increased ahead of volumes, versus the same period a year earlier, by 18 per cent to $2,027 million. This was as a result of the average unit price, in US dollars, increasing by just under 5 per cent. With the Japanese herd still recovering after the 2014 PEDv outbreak, with recovery starting in earnest in late 2015, demand for imported product has remained buoyant. However, as the recovery continues, it may be expected that demand will begin to taper off as the year progresses. The United States remained as the main importer to Japan, and volumes remained largely stable on the year earlier. Within this, there was an increase in fresh product, while frozen product volumes decreased. This reflects a shift in focus from the US Meat Export Federation, who are pushing their promotional efforts on chilled cuts, where they can derive the strongest returns. Shipments from Canada and Mexico were up 7 per cent and 8 per cent respectively. Imports from the EU increased 31 per cent in the first six months of the year. This was driven by an increase from all member states who exported to Japan, with Danish imports up 14 per cent, while Spanish shipments increased more than 34 per cent.